I just looked at my notebook which was up during the weekend. While the one page loaded was Newsgator (and not much else), Windows was reporting low virtual memory. 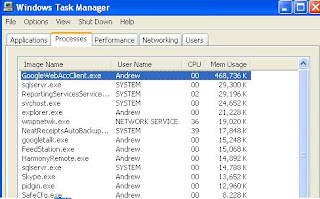 I took a look at the task manager. Egad!! I wonder what it was accelerating that required it to take over a third of my computer's memory. Since Firefox is also known to be a bit of a memory hog when it's been running for prolonged periods of time, it's always a good idea to shut down Firefox (and maybe even Google Accelerator) when not in use. Anyone else seen this? I've seen the same thing as well on my P4 XP Pro laptop. I opted to uninstall the software instead of fighting with it! Might there be a memory leak? And your advice about shutting down Firefox (my preferred browser) is right on. I have a bad habit of walking away from my computer for days, only to return and see Firefox all but responsive.